“Wow. Best. Chicken. Ever.” – Gregory on Facebook. “Best fried chicken I ever had.” – Troy on Facebook. Everyone (even our editor) agrees; Petrie Terrace’s new American booze and hot chicken shack, Fat Belly Jack’s, has plucked the title of best fried chicken in Brisbane! After a poultry pilgrimage to the States, determined to discover the secrets of the world’s greatest fried chicken, co-owner Ben Kagan found the crispy, golden bounty in Tennessee. 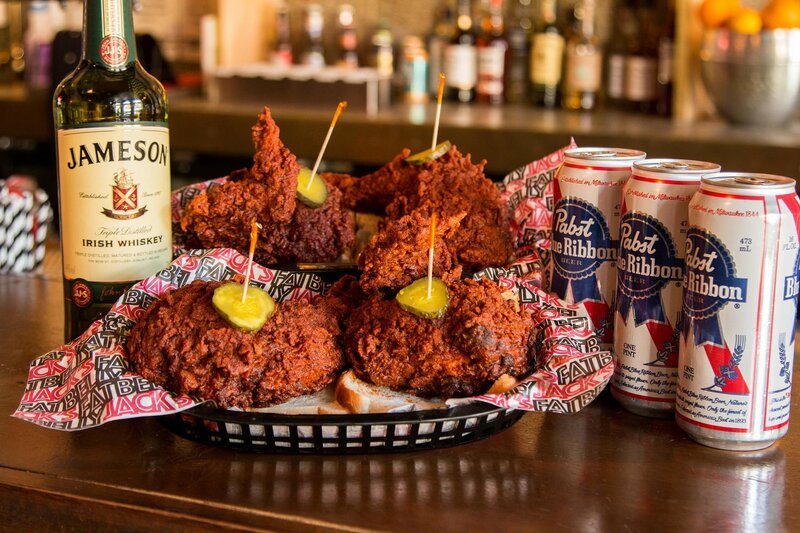 Now, Fat Belly Jack’s has swung its doors open and immediately set out on completing the Lord’s work of offering up a solid reproduction of Nashville’s greatest creation (put your guitar down, cowboy, we’re talking about hot chicken!). All of the champion chicken dishes come with a tasty side and your choice of heat level; pick from southern-style, mild, medium, red hot and “really f$!king hot” or try them all for your own personal Hot Ones experience. The red-hot, Fat Belly burger with crinkle cut fries is an awfully appealing offer, but it becomes downright irresistible when you pair it with a boilermaker – a craft beer and a shot of whiskey, (or, as it’s more widely known, liquid happiness). You’ve heard the hype, but you can’t really be sure that this is the best fried chicken in town until you’ve tried Fat Belly Jack’s for yourself. A stacked bar, authentic atmosphere and hella good hot chook; you’re bound to have a cluckin’ good time. - the gourmand who can't look past good chook.